A legal peril few were likely aware of, it was in fact the case for decades that attending a meeting for even one day was deemed “work” under the law and therefore illegal without a permit. Most foreign visitors simply ignored the law and risked arrest by entering the country on a tourist visa to participate in meetings. Arrests were rare, and people took the remote risk for granted. Yet, in the back of their minds, there was fear and worry. Now, attending a business meeting without fear of arrest means only obtaining a business visa – at least until immigration law fully catches up. The link between the work permit and immigration laws is that foreigners must enter Thailand on a Non-Immigrant B Business Visa to obtain a work permit. With all the hype of foreign direct investment glory, the irony was that attending the kinds of meetings that lead to local investment could be prosecuted as a crime. No one who has pondered this could imagine why a work permit was necessary. 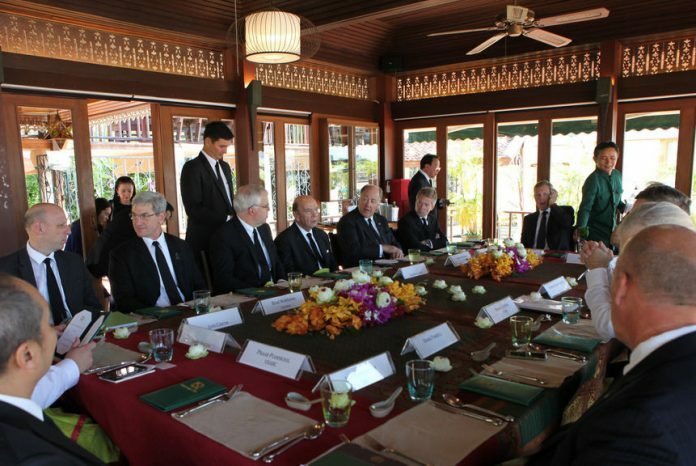 The illegality even extended to high-ranking executives of multinational companies coming to visit their Bangkok subsidiaries for meetings with local counterparts to supervise operations. Government after successive government, efforts to turn the City of Angels into a hub of regional headquarters was apparently at odds with the outdated law. Complaints from the foreign business community prompted the Labor Ministry’s Department of Employment, or DOE, to seek a ruling from the Council of State, the government’s legal arm. In 2013, the council ruled in favor of foreign investors, saying that attending business meetings did not fall within the law’s definition of “work.” To adopt the ruling as policy, the department issued internal written guidelines excluding business meeting attendance from the work definition and permit requirement. Practically, no arrests have been made by labor enforcement officers for violation of the work permit law on the grounds of attending a business meeting without a work permit since the date of the guideline. Because the guideline is a mere internal policy with no force of law, the DOE ultimately put a regulation in place regarding activities not classified as work two years later. “Attending meetings or consultation,” and “Attending meetings to discuss business” were no longer considered “work” – and as a result, a work permit was not necessary. Under the new work permit law, meetings are no longer considered work, so the DOE no longer cares what type of visa foreigners obtain. They can have tourist visas, or any visa, or no visa at all if the country of residence is on the waiver list. But visas are governed by a separate law, the Immigration Act of 1979. Work permit and immigration laws are intertwined, and a violation of the former can be enforced by immigration police conducting raids on places of business. In an attempt to align the immigration and work permit laws, the former was amended in March to cover the latest key amendments in the work permit law. Unlike the new work permit law, no rulings or guidelines or regulations have been issued excluding business meetings from the definition of work under the new immigration law. In principle, this is the same set of laws, and the new immigration law is meant to incorporate the new work permit law that allows business meetings without the need for a work permit or a Non-Immigrant B Business Visa. One should validly assume the definition of “work” in the work permit law and the immigration law is the same, with “Attending meetings to discuss business” excluded from the definition, even though there are no express words authenticating that assumption. Just as with the work permit law, no work permit or a business visa should be required under the immigration law. Should be legal isn’t the same thing as legal, when it comes to the letter of the law. The lack of specific wording prompts immigration police in the field to continue to interpret the immigration law in that traditional way: Attending business meetings remains work or business, and therefore the business visa is always required. Immigration still sees tourist visas for the purpose of tourism and unusable to attend business meetings – which are for work and business, and must therefore come under the umbrella of a business visa. Their view is that any foreign executive attending a business meeting on a tourist visa is in violation of immigration law (which in turn incorporates some key provisions of the work permit law by way of reference), and risks being arrested if, for instance, authorities are tipped off by a rival company. Obviously, foreign investors are caught between the inconsistencies of two government bodies interpreting two overlapping laws differently. While foreign executives are relieved that they do not have to apply for a work permit to attend a business meeting, their unnecessary burden remains taking the precautionary measure of applying for a business visa before arriving in the kingdom. It’s the only way to be assured immigration police won’t take them into custody. To circumvent the two connected laws running in opposite directions, there are two options. The first is easier: The Immigration Division of the National Police Bureau might consider issuing a clear, practical, internal guideline to underline its policy to its law enforcement officers to adopt the regulations and guidelines of the DOE that a tourist visa or the normal visa exemption is sufficient. The existing broad language of the new immigration law already provides a solid foundation for this approach. The second option is more complicated, but achievable: Make an immigration regulation or announcement that packs the punch of law along the same lines as the DOE regulation to expressly exclude business meetings from “work.” The proposed regulations should steer clear of any doubt by specifically permitting meeting attendance on a regular tourist visa or visa waiver. Either move will alleviate the worries of top executives in multinational companies who visit Thailand to join meetings that their freedom will not be at stake for the technical reason of traveling on the wrong visa. The effort would square the two laws and strengthen Thailand’s reputation as a leading, investor-friendly nation in the region. 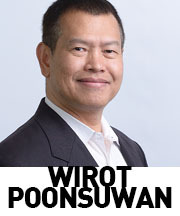 Wirot Poonsuwan is a practicing attorney and can be reached at wirot AT brslawyers.com.